Yesterday I was reading an article in The Economist about the whisky industry, and I found a thread to follow: Spain being the third largest export market of Scotch whisky! After having travelled through different European countries and seeing the drinking habits in each place I could almost predict that more whisky was consumed here than in other European countries. 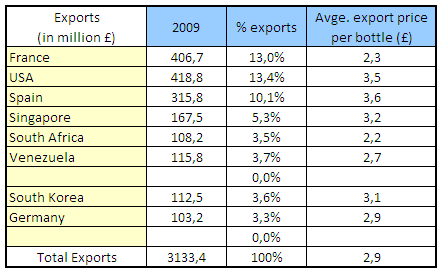 I searched for the source of these data, the Scotch Whisky Association (SWA), which published a release in April 15th on the export data from 2009. Despite the global crisis, whisky exports continued to rise both in terms of revenues and bottles. But let’s dig into the data. Looking first at the numbers of bottles exported we see that the leading country is France with almost 180 million 70cl bottles, followed by USA and Spain (with 87 million bottles). The first 10 countries account for 60% of the export market. Because France and USA are more populated than Spain, I was interested in comparing the ratio number of bottles exported by inhabitant… and now the leading country was by far Singapore, with over 10 bottles per inhabitant per year… either there is something we miss in the picture or there is very heavy scotch drinking going on there (taking into account that not everyone drinks whisky, less people imported scotch). Among those 10 main markets Spain again came in third with an average of 1.9 bottles per inhabitant, though we should keep in mind that this number only reflects the bottles exported from Scotland; not whisky consumption in the country (Irish, US or Spanish whisky is not counted here). Scotch whisky exports, by number of bottles. There is another statistic given in the same release: revenues. What I wanted to know with this was the export price per bottle. Not all top ten countries by number of bottles were among the top ten by revenues, but with those which were I did the calculation. The average price resulted 2.9 sterling pounds, around 3.37 €… so the other ~9€ up to the 12€ price you see in the shop are costs related to transportation, retail shops, etc. Scotch whisky exports, by revenues and bottle price. In the SWA site you may find very useful information such as distilleries to be visited in Scotland, etc. When we want to a Scottish distillery, we were told that even when they have an in-factory shop, we could buy their whisky cheaper in Spain because of the different taxes. Also in parts of Southeast Asia, part of the business protocol is offering a bottle of VSOP cognac. Maybe it works so as well in Singapore. Well tomorrow I’m bringing the fanciest A400M keyrings and mock-ups instead of bottles of cognac/whisky, let’s hope it doesn’t break the protocol.